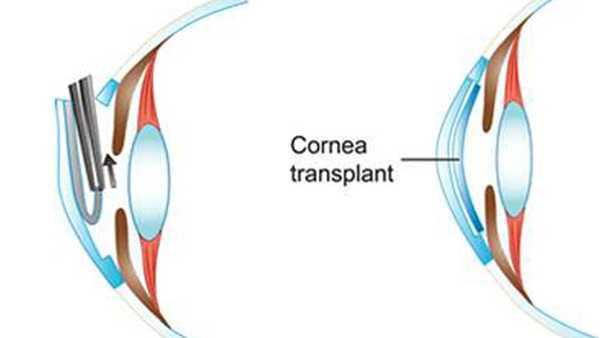 Corneal transplants are a cure for corneal blindness, which accounts for about 12 percent of all blindness in the country. Seventy-five percent of the blind in the United States are unemployed. Transplantation has a huge impact on thousands of lives and our society. According to a study by the Eye Bank Association of America, the 2,070 corneas transplanted by the Rocky Mountain Lions Eye Bank in 2013 have an estimated lifetime value of $173,487,878 to the recipients. The study compared the medical cost of transplant procedures to the direct and indirect lifetime costs of the alternative —living with blindness or severe vision impairment. Your public health role in the donation process affects these lives as well as the lives of the donor's family. What is a cornea, and what does it do? The cornea is the clear, front part of the eye where a contact lens would sit. The cornea does not have a direct blood supply, so there are very few disease processes in a donor that would rule out cornea donation. 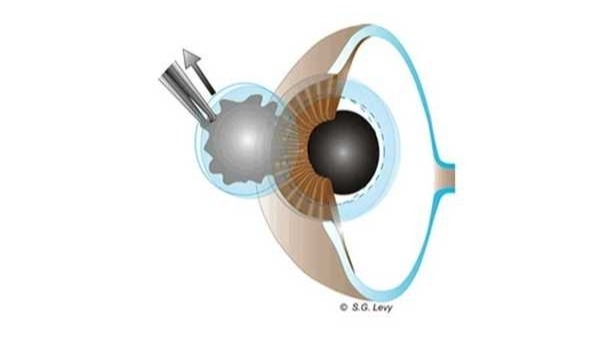 The cornea is responsible for 75 percent of the focusing power of the eye. 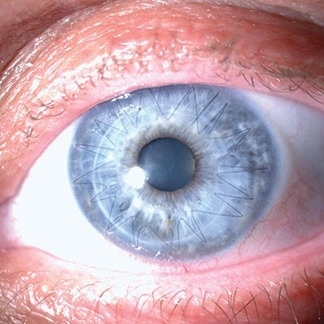 Diseases or trauma to the cornea account for about 12 percent of all blindness in the United States, and it is the second leading type of blindness worldwide. The Rocky Mountain Lions Eye Bank restored the sight of 2,297 people in 2014 from eye donors in Colorado and Wyoming. The cornea has 5 layers, but two of the most important are the epithelium and the endothelium. The epithelium forms the protective, outer covering of the cornea. Like all epithelial cells, these are continually sloughed away and replaced. The biggest danger to a donated cornea is time between death and preservation. Because one stops making tears at the time of death, it does not take long for the epithelium to dry out, slough away and expose the inner layers to infection. This is a slit-lamp micrograph of a healthy, donated cornea. Notice how it is translucent and smooth. This is a slit-lamp micrograph of a cornea that has had a long death to preservation time. Note how a large area of the epithelium in the lower half has completely sloughed away. The folds you see are evidence of swelling. Finally, the white haze in the lower right corner is an infiltration of white blood cells. This cornea cannot be transplanted. The endothelium is a single-cell layer on the back of the cornea. These cells' only job is to pump water out of the cornea, thus keeping it clear. When these cells fail, water builds up in the cornea and it becomes opaque. These cells are critical to a successful transplant because they do not regenerate. What you are born with is what you get! A cornea must have at least 2,000 cells/mm2 to be transplanted. High cell counts will typically be matched with younger recipients. These endothelial cells continue to be viable for several hours after death. 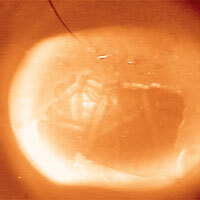 Delays beyond 18 hours render the cornea non-transplantable in most cases. Specular micrograph of an endothelial layer of a donor cornea. These living cells are critical to a successful transplant, as they do not regenerate and must last the lifetime of a recipient. Extended death to preservation times can put the endothelium in danger. A diseased or damaged cornea is removed from the recipient using a trephine, an instrument much like a cookie cutter. The diameter of the graft is determined by the eye bank during the microscopic examination of the donor's cornea. A similarly sized graft from the donor cornea is made in the same manner and then placed into the recipient's eye. The graft is put into place by hand using microfilament sutures. Another, newer procedure transplants just the endothelial layer of the cornea. This allows the eye bank to transplant corneas that otherwise couldn't be used. 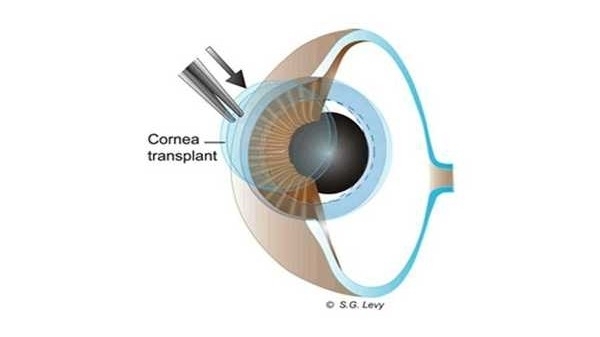 For example, if the cornea is scratched heavily because of trauma in a car accident, the eye bank can split the cornea lengthwise and transplant just the back half for certain recipients who have diseases of the endothelium. 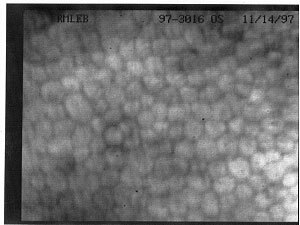 After the eye bank removes the outer portion of the donor cornea in the lab, the resulting endothelial graft is very, very thin. 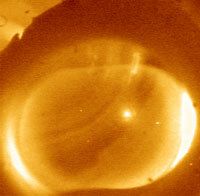 Here is an optical coherence tomography photo of the split graft of the donor cornea. It is only 65 microns thick. By comparison, a human hair averages 100 microns in diameter! In surgery, the patient's endothelium is removed through a small incision in the periphery of their cornea and the new, very thin endothelial graft is placed inside. There are no stitches, and many patients see 20/20 within a few days!